Picking the day and time for your baby shower is giving ample time before your due date. The baby shower should be planned four to six weeks before the baby’s due date. This celebration is about bringing the women in the expecting mother’s life together coming from her friends and family to gift her and prepare her for the day that she gives birth to the child. A baby shower guest list typically is all women including the mother-to-be’s closest friends and family. The baby shower has changed in modern times with it not being out of the norm to have both men and women at your baby shower. Designating your guest list early in the process will allow you to select the right size venue for your event. Jonathan’s Ristorante is an Italian restaurant that offers catering in Suffolk County that can accommodate a wide range of party sizes. 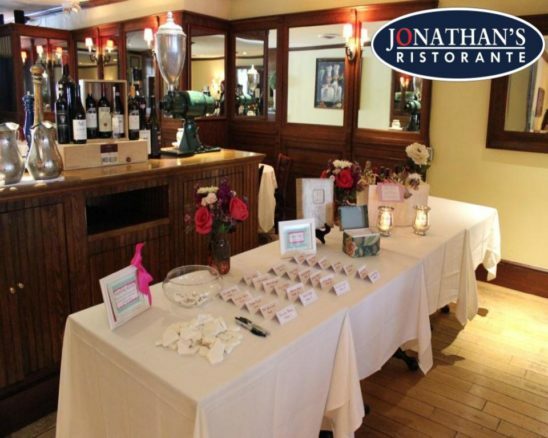 Baby showers are a big celebration for women expecting a child and if you are looking for catering in Suffolk County, Jonathan’s Ristorante can help you. Our website has different catering options and online table reservations with a kitchen led by Chef Onofre. Jonathan’s Ristorante is a popular Huntington restaurant that allows for reservations at the number of 631-549-0055. This dining experience is an intimate location for baby showers, bridal showers, and more. We are located at 15 Wall Street Huntington, NY 11743. Having a theme and color scheme will keep your party planning on track. From invitations to the favors, this theme and color scheme should carry through. Planning a baby shower in Suffolk County does not need to be difficult. With Jonathan’s Ristorante, our catering in Suffolk County can help make your event perfect. Contact us today for more information! Jonathan’s Ristorante is a popular Huntington restaurant that allows for reservations at the number of 631-549-0055. This dining experience is an intimate location for baby showers, bridal showers, and more.